Phil Strano, Senior Investment Manager at Yarra Capital Management, examines the fiscal position of the State and Federal governments, and what falling stamp duty revenue means for Australian credit investors. 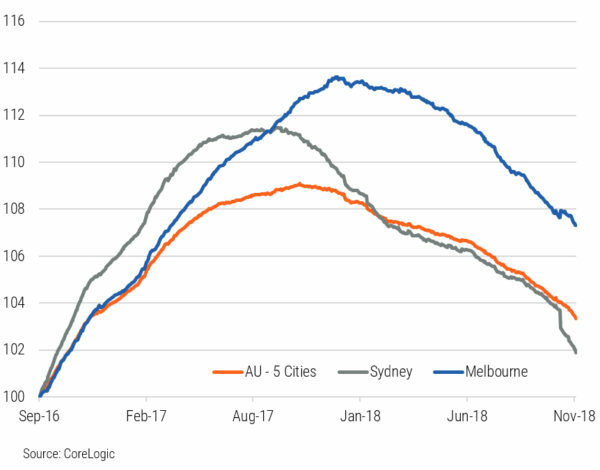 Following an incredible period of sustained house price growth, particularly in both Sydney and Melbourne (refer chart 1), prices in both cities are now down 5-10% from their 12 month peaks and further moderate falls are expected. This should come as no surprise given the well telegraphed tightening of lending standards and long shadow of the Financial Services Royal Commission. For State and Federal governments, the housing boom has delivered a river of gold in the form of high transfer duty revenue (i.e. property taxes) which today represents 25-30% of total State taxation revenue. 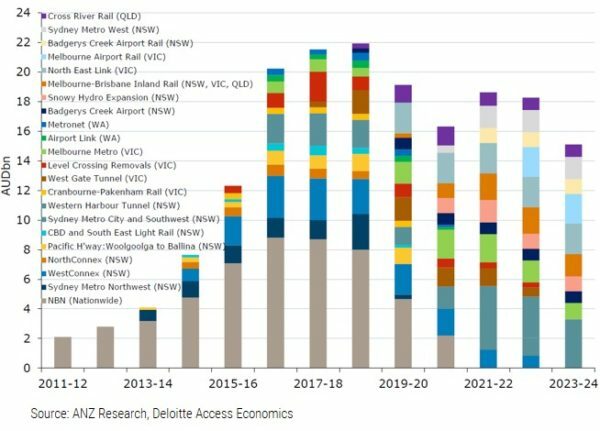 While the NSW and VIC governments are forecasting budget surpluses in 2018/19 ($3.9bn and $2.3bn respectively), with house prices now moderating and clearance rates falling, government income is now declining at precisely the same time that major capital expenditure is reaching its peak: Australia’s major infrastructure projects peak next year, when more than $20bn of committed investment will fall due (refer chart 2). Moreover, in the run-up to its election, the re-elected Victorian Labor government forecasted a doubling in State debt from 6% to 12% of Gross State Product (GSP). While in the near term the NSW and Victorian governments are likely to retain their AAA credit ratings, spreads are starting to widen amid concerns around increased debt issuance and the potential for medium-term credit downgrades. Even so, neither state will have any trouble funding their budgetary positions. Indeed the opposite approach – choosing to protect ratings in a downturn – would likely be far more damaging, resulting in a more painful decline and much slower recovery. 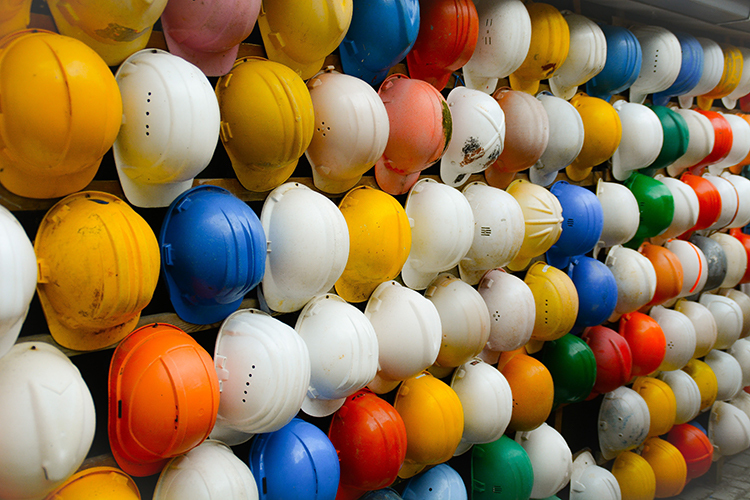 In our view these major and productivity-enhancing infrastructure projects are actually critically important while the housing market rebalances. Given our base case is for increased government infrastructure spending to support economic activity and aid in a measured landing in Australian housing, we remain comfortable with the outlook for Australian credit. Following a recent widening in spreads (+20-30bps), the new IG bank sub debt issue from Bendigo and Adelaide Bank 10nc5s 2023/28s (BBSW+245bps), for instance, offers investors particularly good value.